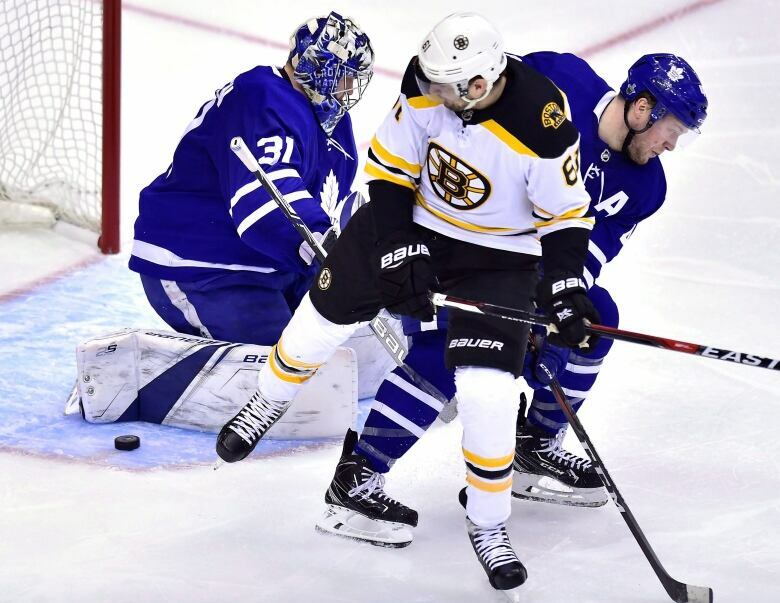 The Leafs find themselves down 3-1 in their opening-round series with the Boston Bruins after failing to take advantage of the absence of centre Patrice Bergeron. 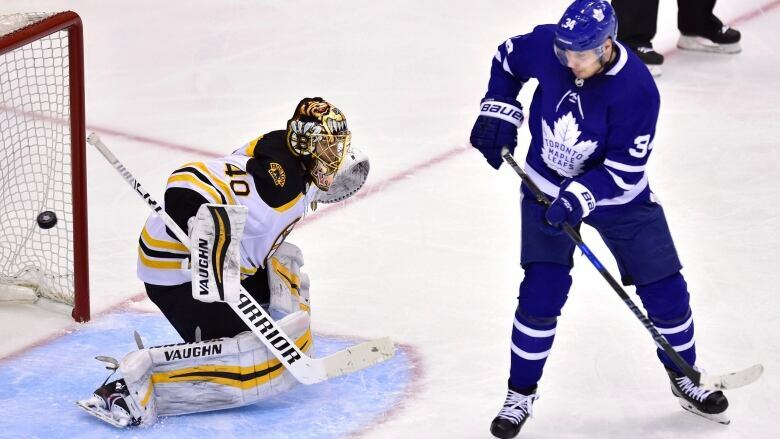 The Toronto Maple Leafs whiffed on an excellent opportunity to even their opening-round series against the Boston Bruins on Thursday. The Bruins were without Patrice Bergeron, their heart-and-soul, first-line centre, in Game 4 because of an upper-body injury. But the Bruins persevered, taking advantage of two risky defensive pinches to skate away with a 3-1 victory at the Air Canada Centre and a 3-1 series lead as the first-round matchup returns to Boston for Game 5 on Saturday. "We were set up pretty good," Maple Leafs coach Mike Babcock said of Bergeron's absence. "We didn't take advantage of it." The Bruins did a masterful job keeping Bergeron's injury a secret. He didn't skate in the morning, but he was in the dressing room answering queries from reporters afterward. When the Boston hit the ice for its pregame skate, the Bruins revealed on their Twitter account that Bergeron, nominated earlier in the week for the Selke Trophy as the best defensive forward, would miss Game 4. Bruins coach Bruce Cassidy reported after the game Bergeron has been dealing with this injury for a while, but that he was hoping to play in Game 5. The late-breaking drama didn't leave the Maple Leafs much time to prepare for Bergeron's absence. And then a perfect storm developed early for the visiting team. Just 28 seconds in, Bruins defenceman Torey Krug floated a drifter from the point that Toronto goalie Frederik Andersen didn't see because of a Riley Nash screen, giving Boston the early 1-0 advantage. The Maple Leafs bounced back to pull even with a goal from second-line centre Tomas Plekanec. After that, Toronto took over the game. The Maple Leafs enjoyed an outstanding middle period, particularly from the nifty Mitch Marner. He was determined, but there was no go-ahead goal. Instead, late in the second period, Toronto defenceman Jake Gardiner got caught on a pinch and the play resulted in a two-on-one goal by Brad Marchand from linemate David Pastrnak. On the pinch, centre Auston Matthews was out of position to help out his aggressive defenceman. Matthews was caught again when Maple Leafs defenceman Travis Dermott got trapped on a pinch early in the third period, resulting in a similar two-on-one goal, this time from Boston left winger Jake DeBrusk. 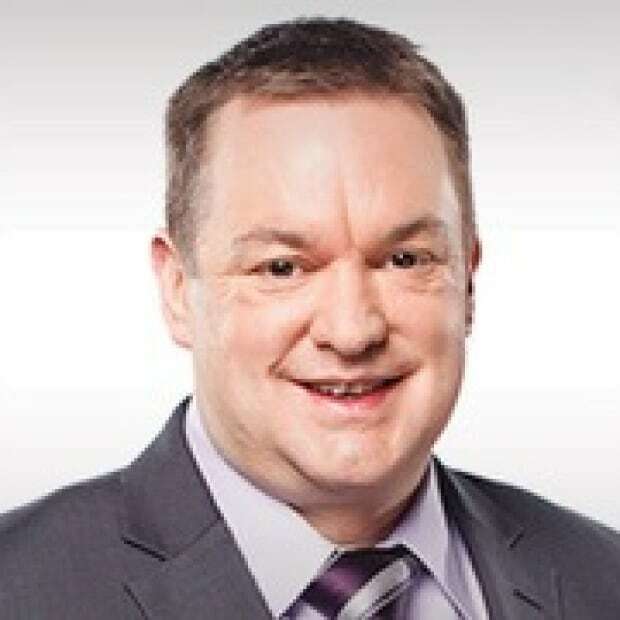 The Bruins have been the more the determined team in this series and have exposed the weaker Maple Leafs defence with their speed and skill. But Toronto hasn't helped its cause with a lack of finish around Boston goalie Tuukka Rask. There is no doubt Rask was outstanding again. He made 31 saves, including a show-stopper on Patrick Marleau on a two-on-one after a dandy pass from Marner, and again on a Marner breakaway. Rask now sports a solid .926 save percentage. But while Rask was the Bruins' best player, it was easy to notice the Bruins didn't miss a beat with Riley Nash in place of Bergeron between Marchand and Pastrnak. When Bergeron was out for 13 games late in the season because of a broken foot, it was Nash who was promoted to the Bruins' top line and he played well. Nash, 28, was a first-round selection (21st overall) by the Edmonton Oilers in 2007. But the Oilers weren't pleased when the Kamloops, B.C., native decided to return for his third year at Cornell University, so he was traded to the Carolina Hurricanes in 2010 and wound up in Boston as an unrestricted free-agent two years ago. On the other side, Matthews' middling play also was noticeable. If the Maple Leafs want to extend the series, the big sophomore has to get chugging. "The great thing about being a young guy in playoff time is you get lots of lessons and no one is more aware than he is right now," Babcock said. "I'm assuming he thought he was going to come in tonight and dominate the game. "That didn't happen. But the other people you're playing against are pros, too, and they're trying, too. They're competitive. There is regular season competitiveness and there is first-round Stanley Cup competitiveness and it keeps amping up the whole way through. "We have to play better than we are right now."